Album Info: Commuter Rail, Light Rail, Streetcars, and Rapid Transit. For Commuter Rail excludes pictures of before public agencies took over. Those shots are in the albums of each railroad. 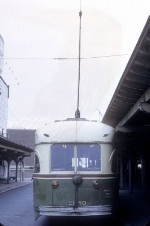 Title: Moving a PCC Car in 1963. Photo by Ray Ballash. Description: This is Presidents’ Conference Committee (PCC) streetcar #3100 of the Los Angeles MTA being moved from L.A. to the Orange Empire Railway Museum in Perris, CA. The exact date in the spring of 1963 is unknown as is he location. This is the car recently painted and rennovated by the Museum. 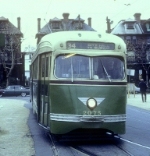 Note, the PCC was formed in 1929 by the presidents of the U.S. streetcar systems to produce a modern streetcar to compete with buses and the automobile. 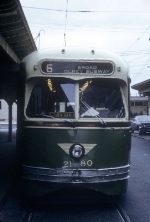 For more information Google "PCC streetcar" and start with the Wikipedia article. For more information on this car go to the Museum's Web Site OREM.ORG and click on "Yellow Cars" at the bottom of the page. Title: CTA Skokie Swift at Oakton St. Title: CTA 50s Skokie Swift Oakton St. Description: This was the end of third rail and the start of trolley wire. The conductor has the trolley pole up on the third car and the motorman has the pole on the first car part way up. Title: CTA 53 Skokie Swift at Oakton St. Description: On Chicago, North Shore and Milwaukee Skokie Valley Route. Title: Philadelphia Suburban Transportation Company #4 at Fairfield Ave. 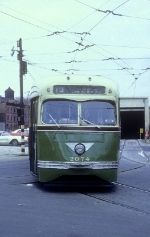 Description: Note the Market-Frankford Line cars in the background right. 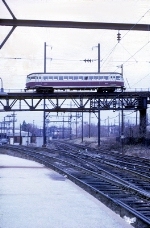 Description: Note the Market-Frankford Line cars in the background.